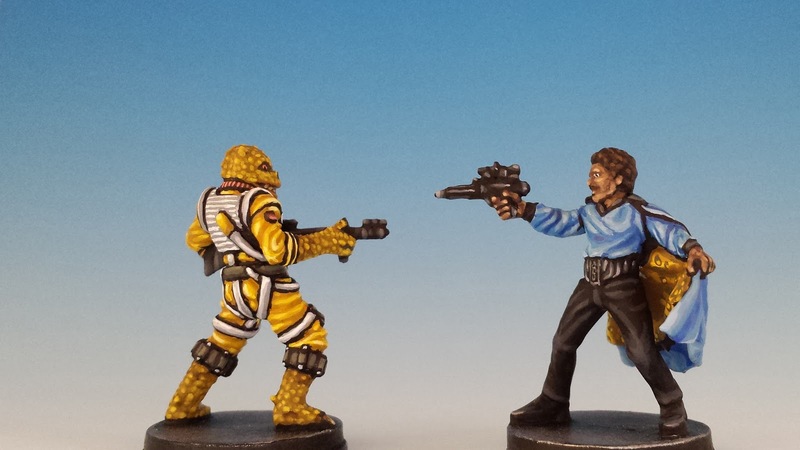 Behold painted miniatures of Lando Calrissian, Bossk, Agent Blaise and the ISB Infiltrators. They come from the Ally and Villain packs that were released in conjunction with The Bespin Gambit, the latest expansion for Star Wars Imperial Assault. Props to Gary Storkamp, the sculptor of Lando Calrissian. Rather than modernizing Lando, he's preserved several key features of Billy Dean William's character that are thoroughly dated to the 1980's: his high waist, his pirate shirt, and especially his magnificent Jheri Curls. 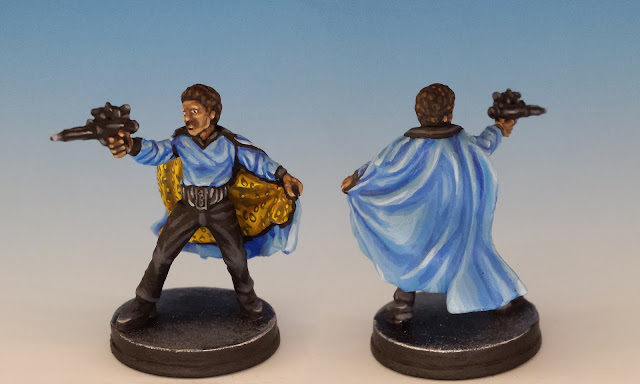 But when it came to painting Lando, I had my own challenges. One was to capture the baby blue of his blouse, or the soft caramel of his skin tone. 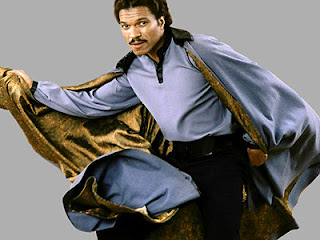 But the most important element of Calrissian's appearance is the lining of his cape. This gold/green paisley is what gives Lando his flare and style. Without capturing the lining, this miniature would be a nullity. So I worked hard to create the impression, if not the replica, of this complex pattern. 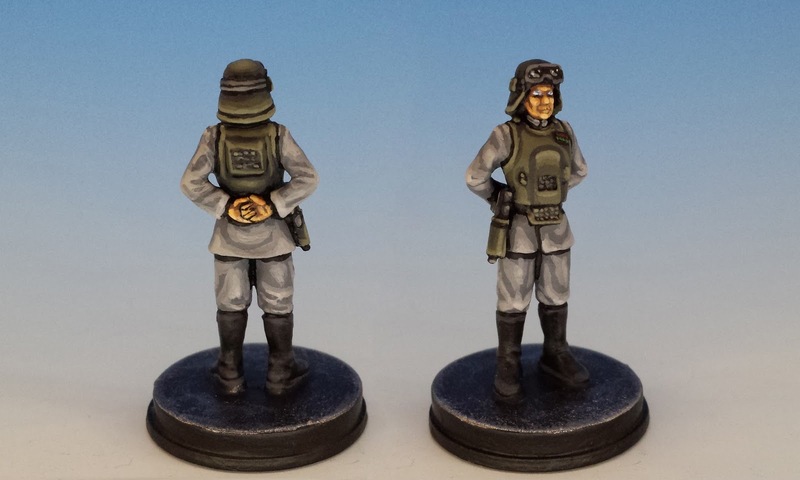 The sculptors of Imperial Assault have been methodically ticking off all the staple poses of the villain. We have the Evil Pointing, the Sinister Hand Clasp, and the Karate Chop. Thankfully, we now have Agent Blaise with a classic Fist Shake. Nothing says, "I'll get you one day, you stupid heroes!" more eloquently than vibrating your fist in the air. And we know that Agent Blaise is an old pro, because he knows to take off his helmet before trying this maneuver. How else will the Rebels know that you're grimacing? I've given Agent Blaise a little grey at the temples. I'm pretty sure that only an age-addled person would opt for a fist shake, rather than using the large sniper rifle he's holding in his other hand. Thankfully, Old Man Blaise is accompanied by the ISB Infiltrators. 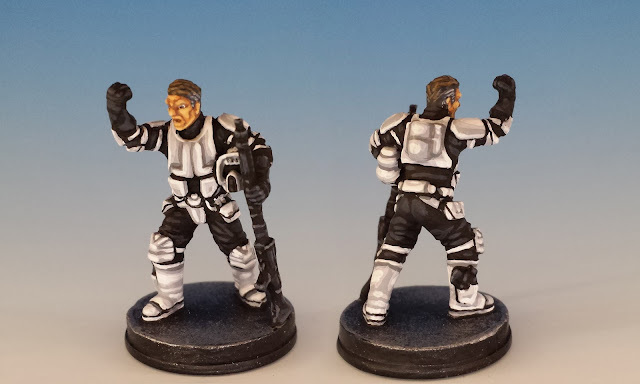 Since the ISB (Imperial Security Bureau) is the Gestapo of the Empire, I tried to make these troopers as Aryan as possible. But it was not clear from Fantasy Flight Game's card art whether these miniatures are supposed to be wearing actual purple armour, or whether they're in the standard whites of the Stormtrooper that's been artistically tinted by dim light. I decided to go for a purple-blue armour -- it seems better suited to their covert operations -- and marks them out as special badasses. 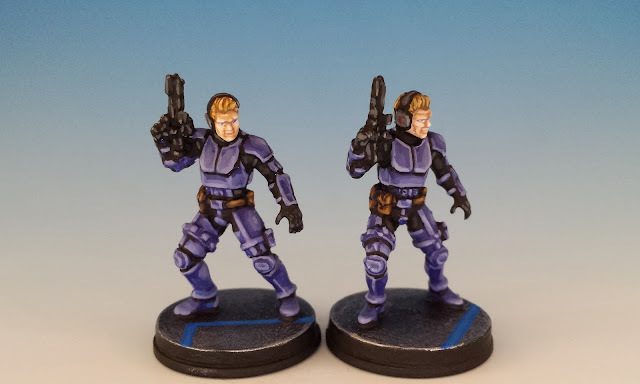 But because I like hedging my bets, I couldn't help myself from kit-bashing some ISB variants. 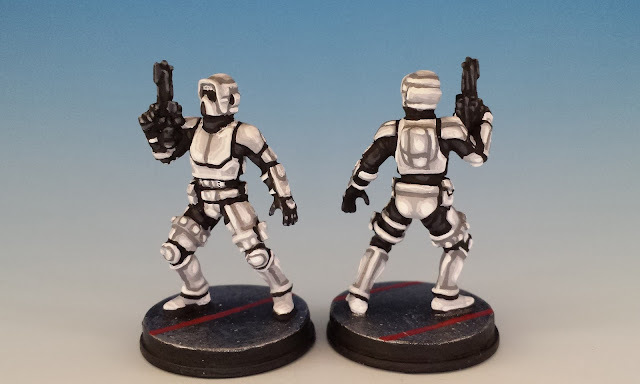 Using Scout Trooper heads and backpacks from some old WotC miniatures, I created a couple elite Infiltrators with traditional white armour and helmets. They're in perfect camouflage for a commando raid on a chessboard or zebra sanctuary! These scouts join some of my other conversions, like the Mon Calamari Saboteurs, the Aqualish Hired Guns and the Gran Rebel Smuggler. 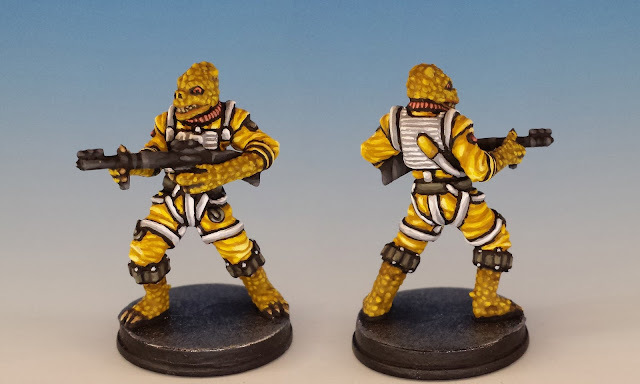 Finally, there's Bossk. I loved painting this cold-blooded bounty hunter. His palate (yellow, yellow-green and white) is as simple as a flag but completely arresting. He's a perfect encapsulation of the Star Wars aesthetic: simplicity and strangeness in equal parts. 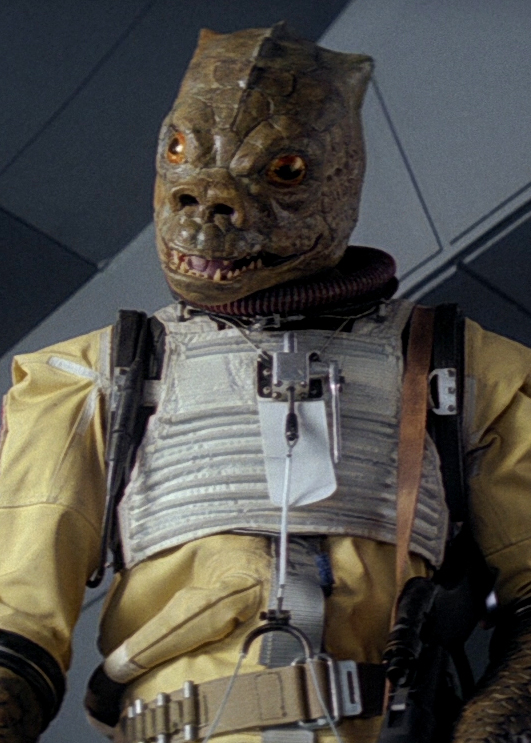 But the thing that gives me most pleasure is that sculptor Gary Storkamp resisted the temptation to make Bossk look like he's growling. Instead, he's maintained the disquieting reptilian smile that marked out Bossk during his cameo in The Empire Strikes Back. 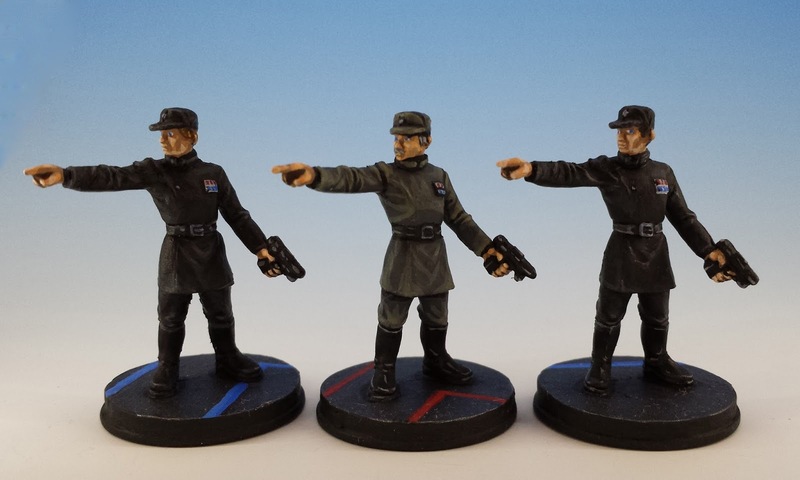 Stay tuned for pictures of the rest of the miniatures from The Bespin Gambit in the next few days! And if you've painted any of these miniatures, please let me know in the comments. Great stuff, especially Lando's cape! I think there are many more villainous poses to go through. I await the steepled fingers. I think Emperor Palpatine is going get steepled fingers. Either that, or the more conservative "Hands is the Sleeves of His Robe". And I hope (probably beyond hope) that they'll release Grand Moff Tarkin with An EVIL CHIN RUB. Mike Drop! Thanks everyone - I'm really gratified to hear that you like the miniatures. For some reason, I really had the fire in me to get them done quickly. A really excellent post! This is some top notch work; they all look great but I think that Lando is by far my favorite. You're correct that getting the colors of his disco outfit right is pretty essential, and I think that you really nailed them. I suppose you could call the outfit dated, but I like to think of it as an accurate reflection of Lando's "suave" personality. Yes - Lando is a little wide-eyed. Half-lidded (bedroom eyes) would be much more true to form. I tend to make my eyes a little big, and I don't really notice until I start photographing the minis. Thanks for the tip! Absolutely beautiful pieces here. I agree, the work on Lando is my favourite, I really think you totally got the essence of the character with your paintjob. Bravo! I desperately need to get involved with these figs, perhaps a game of west end games is in order?